While this page looks quite simple, it can really get you to the treasures that we have uncovered after years of exploration and research in Bermuda. If you are looking for a detailed map of a parish, just click on a parish in the map below and you will be taken to the detailed map of the parish. If however you want to know about a parish and what it offers including attractions, activities, restaurants, transports, shopping, accommodations etc, then go down to the table below the map and click on a parish link for full description with pictures. Bermuda has 9 parishes. They are like districts or counties. Other than the parishes, there are three important places in the island - Royal Naval Dockyard at the west end is the major cruise port of Bermuda, Hamilton City at the center is the capital of the island, and St. George in the east is a historical town and former capital. 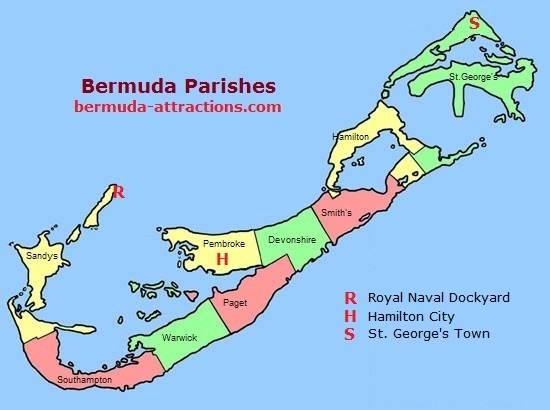 Explore the Bermuda parishes through the links below and find out the hotels, restaurants, beaches, attractions, recreational activities, buses and ferries for a parish, and lot more information. Also know about the three most important locations in the island - Hamilton, Royal Naval Dockyard and St. George. Hamilton City, the capital of Bermuda is NOT in Hamilton Parish. It is in Pembroke Parish instead. Town of St. George is in St. George's Parish. The historic town is a designated UNESCO world heritage site. Royal Naval Dockyard is located at Sandys parish and at the western tip of the island. This is where all the large cruise ships dock. Once a Royal Navy base, it's now a large complex with many tourist attractions. Which parish is good for vacation stay? If you are trying to figure out which is the parish to choose for your stay on your vacation, the answer lies in what you want in the location - Beach? Great Restaurants? Shopping? Great luxury hotels or budget accommodations? Privacy? All of that? Check out Location to Stay to know which is the location or parish best suited for your requirements. The parishes were formed during the early British settlement days in 1600s. Initially the administrative powers were given to the main sponsors of the parishes. Most parishes were also named after the sponsors. To know about the historical background of the parishes and their formation, visit History of Parishes. 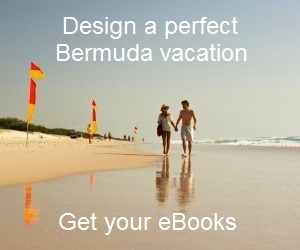 1) Check out Bermuda Map for all the maps that you will ever need in Bermuda. 2) Check out Bermuda's Parishes to know about the historical background of the parishes and how they were formed.